With Nor’easter Nemo bearing down on us, mister gardener said perhaps I should remove my last blog post entitled, “It’s Snow Wonder I Like New Hampshire.” He said I might feel differently about snow after the weekend. I chuckled at the time but later I considered his suggestion. With predicted amounts changing by the hour for the coastal region of New Hampshire, we are still unsure whether we will have 24″…. or 32″ as we heard one forecaster announce tonight. Cancellations are streaming across the television and on the radio. By 9 pm, schools and colleges, 2,933 flights, businesses, functions and events have been canceled or postponed. The entire area is shutting down for perhaps historical amounts of snow. We shopped today for all the survival necessities found on everyone’s lists, then dined out tonight. Native New Englanders, clerks, checkers, baggers, waiters, with whom we exchanged greetings throughout the day, seemed nervous. These hardy, robust, resilient natives who normally take everything in stride, expressed real concerns about Elmo. 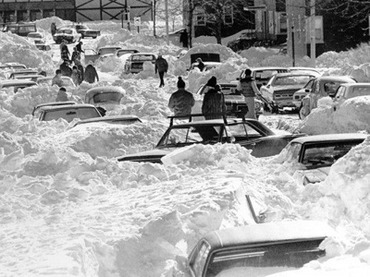 The 1978 snow-mageddon was all the talk today…. the storm with 80 mph winds that left 10 foot drifts, flooded homes, stranded motorists, tons of debris, collapsed roofs, and 99 New Englanders dead. We knew about the storm 35 years ago but mister gardener and I were unaware of the extent of damage the storm caused. With our minds changed about this potentially crippling storm barreling down on us, we nervously decided to re-check our survival to-do list tonight. Water… check. Batteries…. check. Groceries….. check. Dry firewood…. check. Snow shovel…. check. iPad, iPhones charged…. check. Bird feeders filled…. check. Laundry washed…. check. Autos fueled…. check. Blankets…. check. How will I spend the days secluded at home beneath drifts of snow? I hope to hibernate, keep my toes warm in front of a fire in the fireplace, hot chocolate in a mug, a good book on iPad. Whether we have total white-out conditions with hurricane-force winds or not, I’d like to block out the dangers of the storm that twists and turns and howls outside. The drapes might be closed for this snowstorm. This entry was posted in snow and tagged Blizzard, Nemo, New England, New Hampshire, Nor'easter, Snow, Storm, Weather by Annie. Bookmark the permalink. Well, the weather certainly can be exciting, if you are wise….and lucky! Life is an adventure! I opened the curtain and the snow is kicking up tonight. We should awake to the full force in the morning. Did you check your house generator in case of power outs? Do you need a good recipe for snow cream as you will be able to make several gallons or more. Here in Virginia, we got a lot of rain and ditches are over flowing with water! Keep warm my good friend and tell Mr. Gardener to stay indoor and keep warm and dry. Get someone else to shovel the snow and keep me posted on how you make out in Nemo! The generator is primed and ready. We do expect to lose power. This will be the third time in a year that we’ve had to fire up the generator for outages. It sounds scary and a little exciting too. I hope you don’t get those super high winds. A blizzard can be neat to watch. I hope we get to see more photos tomorrow.